Once you start getting interested in bass fishing, one of the first, inevitable questions that pops up is: What exactly do bass eat in their natural environment? In this article I want to focus on the various organisms appearing on the menu for bass, where you can find them as well as the lures you need to imitate those creatures. In any body of water there are three distinct zones, the bottom, the mid-water and the top. These three zones are inhabited by different creatures which all make out prey for bass. Let’s go and have a look at what’s going on in those areas. For starters, let’s go down to the bottom of a lake. Depending on the age of the lake, the sediment that has been laid down over time provides a rich haven for various species to thrive. These are, mostly, invertebrates that include crustaceans like crabs, crayfish, and shrimp, molluscs like clams and snails and the larvae of insects like dragonflies which can grow to a considerable size. Apart from nutrition, the sediments, rocks and plants on the bottom can also offer a great deal of protection from predatory fishes. If we next shift our attention to the mid-water section we may observe various other fish species, many of sizes smaller than bass itself, which are actively preyed upon by bass. Other inhabitants of this zone include frogs like the ubiquitous (in Africa) African clawed frog “Xenopus laevis” which have also been introduced to certain parts of North America. Bass go absolutely ballistic for them. Lastly we have a look at what’s happening on top. Here we can find various land based creatures who do not necessarily want to be in the water, but, due to some unfortunate circumstances, find themselves there from time to time. These will, mostly, include insects like bugs, bees, dragonflies, butterflies and grasshoppers. Also, mice or birds which lost their grip on an overhanging bush or tree thereby offering an easy meal for any opportunistic bass. I once caught a bass while fly fishing and noticed something weird protruding from its mouth. I opened the lower jaw and saw, to my immense surprise, the legs of a weaver’s chick which the fish was still in the process of swallowing. The poor bird must have lost its footing while trying to balance itself on a reed stalk. After falling in the lake the patrolling bass promptly gulped it down. While still in the process of swallowing that big, nutritious bonanza it had no issue in attacking my tadpole fly while still busy with its previous meal! Which Lures and Tactics Work Best? Now, having established what bass are looking for to fill their bellies, let’s take a look at the different artificial lures which can be employed in order to catch them! For purposes of this article I chose four different types of lures namely crankbaits, spinnerbaits, poppers and soft plastics. Along the way, I will also share a few thoughts on live bait. If you go into any tackle shop, however small, I can guarantee they will, at least, have a few types of spinner baits to choose from. They are easy to recognize due to two defining features; a spinning blade rotating a weighted cylindrical body. They can also come in a wide range of colours. Spinner baits are, probably, one of the most ingenious artificial lures ever created. I just love the simple, yet brilliant, design. When retrieved, the little blade starts rotating in a propeller like fashion creating vibrations under water which are irresistible to predatory fish (like bass!). When fishing with spinnerbaits, just cast it out and start retrieving. You may alter the depth at which you are fishing by giving the lure more time to sink to a certain level and you can also vary the retrieving speed. Sometimes, especially when the water is a bit on the cold side, it is better to retrieve at a relatively slow speed. Moving over to crankbaits, we enter a different realm of lure fishing. You can find crankbaits in various shapes and sizes and also a multitude of patterns and colours. Originally they were made out of wood, but nowadays it can be different kinds of composite materials. As with most lures they are normally equipped with two or three sets of treble hooks. Crankbaits move differently in the water because of different shapes and/or extensions. One type has an extended lip in front which gives it a zig-zag motion once retrieved while others have a peculiar shape (like a boomerang, for example). Some of the lipped-types are also articulated which adds even more movement. Crankbaits are very versatile and can be employed on the surface, in mid-water and also close to the bottom. You can also experiment with different retrieves, because a tactic that may work one day can fail to produce on another outing due to various factors like weather, temperature, air pressure etc. So feel free to change speed if you do not get the desired effects. The next type of lure is soft plastics. These are almost exclusively used to fish on the bottom with the emphasis on slowly and deliberately. They come in a wide variety of shapes, sizes and colours and one has to keep in mind what kind of natural bait you want to imitate before deciding on which one to use. Having said that, bass are normally not very picky when it comes to selecting bait; as long as it’s big and moving in an enticing manner a bass will, more often than not, go for it. The tactics involved in using plastics are somewhat different compared to those involved with spinners and crankbaits. First of all you have to cast out the bait and give it time to sink down to the bottom. Once there, you have to start a slow retrieve by giving the reel a couple of winds and then stop. This will effectively impart movement for a short distance after which the lure will come to a rest. To an interested bass this may seem like a crab or crayfish scuttling across the bottom with short resting periods in between as is normally their habit. You can expect most of the strikes to occur during this resting period. Therefore, be alert at all times even at the end of the retrieve. In my experience most fish pounce on the bait in the last metre or so during the retrieve. This may be an instinctive response due to an expectation that their prey would soon find refuge on dry ground. Another advantage of soft plastics is the material they are made out of. It seems that bass, once they’ve picked it up, do not let go of the lure as quickly as other artificial baits, because of the soft, rubbery texture which kind of resembles the texture of some of their natural prey. 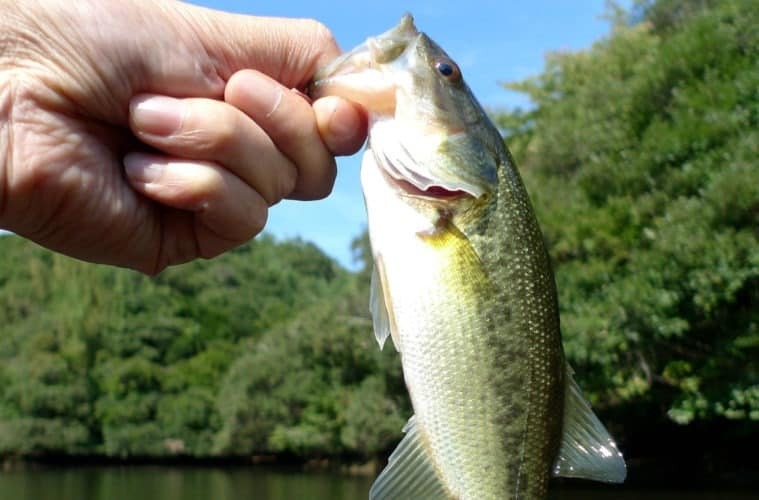 Therefore, even though it’s not hooked initially, a bass normally hangs onto the plastic long enough for you to set the hook in subsequent strikes. Now let’s take a look at the top water lures; the ones imitating insects, frogs and other small creatures struggling in the surface film. I found poppers to be most effective under calm conditions, mostly on hot, windless summer evenings. Similar to fishing with soft plastics, poppers give you the opportunity to take things in relaxed manner. Because they float and are (mostly) fished in a stationery manner, they also give the angler an opportunity to fish close, or even amongst, aquatic vegetation like water lilies, reeds and submerged branches without the fear of getting hooked up that easily on said structures. As mentioned, I believe poppers should mostly be fished in a static manner. After it has been casted out let it stay in one place for a minute or two. You can give it an occasional twitch or two just to attract attention, but remember that a wary bass will be on the lookout for an easy meal. A popper suspended in the surface film with very little, or no movement, signals an injured or fatigued organism at the end of its tether. The evolutionary instincts of the bass, honed over millions of years, recognize this as an easy meal. Be prepared for a sudden attack at any time; even after a minute or two. The anticipation of watching that stationery lure, expecting a strike any moment, is one of the most exciting aspects of bass fishing and on the same level as fly fishing for trout with a dry fly. Finally, you can take a good sized hook (because a bass’s mouth is very big), hook it through the upper lip of a small minnow and let it swim out suspended under a float. If there are any bass in the vicinity, in no time at all you will witness that float going down. Tadpoles, frogs, earthworms and crickets are also good bait and you can just adjust your hook size according to your bait of preference. Like so many other pursuits one also has to be prepared for different eventualities once you have decided to go bass fishing. Check out the unique features of the pond or lake and observe which creatures that can be food to bass are around keeping in mind that most of their food items will be concealed by water and out of view. Therefore, make sure to stock up with different types of artificial baits, as described above, in order to cover all your bases.